Linah Alsaafin is a young British-born Palestinian, who is blogging at various anti-Israeli sites, including Mondoweiss and the Electronic Intifada. I thought that given the circumstances, it wouldn’t be appropriate to respond and point out that while it was certainly sad that her grandfather spent most of his life as a refugee in the Khan Younis camp in Gaza, this was actually a choice made by Palestinians and Arabs – after all, neither the Egyptians who ruled Gaza until 1967, nor the PA and Hamas that have control of Gaza since Israel’s withdrawal in 2005, have done anything to integrate the refugees. 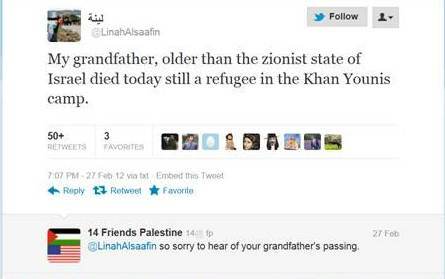 However, since Linah Alsaafin has now published a related post that exploits her grandfather’s story for political purposes, I think there is no reason to be more respectful of the occasion than she herself is. It is a long post that mixes very personal memories with political propaganda that is very typical for Palestinian myth-making activism. First, it is noteworthy that a young man who moved just some 15 miles from one Arab-Muslim community to another Arab-Muslim community was classified as a “refugee” for the rest of his life. Moreover, Alsaafin’s grandfather was brought to Gaza by Egyptian troops, whose war against the fledgling Jewish state he had actively supported – and of course, Mr. Alsaafin would continue to live as a “refugee” under Egyptian rule for almost two decades. A related correction is warranted in view of Linah Alsaafin’s claims about “Zionist” “jet fighters,” because in reality, the fledgling Israeli Air Force had a very hard time procuring suitable aircraft which were urgently needed to fight off the Egyptian bombing of Tel Aviv. No less misleading and mistaken are Alsaafin’s remarks about what she calls “my village of al-Fallujah,” now known under its “Judaized name” Qiryat Gat. As far as the fighting for Faluja is concerned, anyone interested in the facts can check out this timeline of Israel’s War of Independence (scroll down to the map for: Israel War of Independence October 1948 battles, entry for IDF operation Yoav, Oct. 15-22, Nov. 9, Dec. 28-29). The armistice agreement between Egypt and Israel of February 24, 1949, provided for the withdrawal of Egyptian forces from the Faluja pocket. In reality – as Alsaafin could have easily found out just by consulting Wikipedia – Qiryat Gat (or Kiryat Gat) served for decades as a new home for the Jews that had to abandon their ancient communities in North Africa’s Arab countries due to the discrimination, dispossession and persecution they suffered as “retribution” for Israel’s establishment. The town’s demography is reflected in Wikipedia’s list of Qiryat Gat’s “notable residents”: the far-left activist Tali Fahima (who has converted to Islam and fancies herself now a “Palestinian,” but comes from a Moroccan-Jewish family); the celebrated photographer Adi Ness (from an Iranian-Kurdish family); Likud politician and former IDF spokeswoman Miri Regev (from a Moroccan family); and singer and actress Ninet Tayeb (from a Tunisian family; her website is here). Obviously, Linah Alsaafin can afford this kind of activism – she is, after all, a British expatriate who has chosen to study in the West Bank, but has always the option to return to the country she was born. One can hardly ask for a more candid acknowledgment of the cynical manipulation of the refugees’ plight. Arab refusal to assimilate the 1.3 million refugees now living in four host countries— Jordan, Syria, Lebanon and the Gaza Strip, controlled by the United Arab Republic—has been the subject of criticism from Israel and from the Western nations that have contributed to supporting the refugees for most of the 18 years since Israel came into existence. Note that there is no mention of the West Bank – which at that time was of course controlled by Jordan, and in this report it is apparently accepted that the West Bank is part of Jordan. This entry was posted in Uncategorized and tagged Israel, pro-Palestinian, Twitter. Bookmark the permalink. If Israel is a white supremacist regime of aggression how comes it allows Arabs – a Muslim female player, for example – to participate in its football team? I can supply the photo if wished. The fulfilment of biblical prophecy confirmed by history: that’s Israel. A mythical nation-state that was no more than a region,it’s name descended from a Roman insult: that’s Palestine.